Cooperators connected with the apex consumer cooperative federation NCCF turned out in large number to attend the Special General Body meeting held at the NCUI campus on Wednesday. The impressive presence made the reinstated Chairman Bijender Singh say “ it is our good luck that we are here today”. Readers would note that the superceded Board of NCCF was recently restored by the court paving the way for the Wednesday SGM. Speaking on the occasion Bijender said the NCCF Board has been superceded thrice in a time period of two years but I do not wish to go into its details. His speech made it clear that officials have made a mess of the NCCF business. Though on paper it registered a profit of Rs 4 crore, actually it has suffered a loss of Rs 10 crore. Explaining the mathematics Singh said earning from FD and deposits of business associates have been juggled to show as profit. 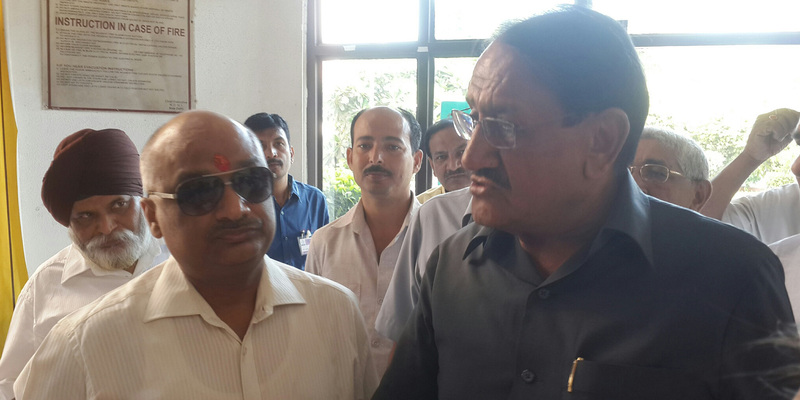 MD A K Jain expressed his agreement with Bijender’s assertion while passing the routine agenda. But the highlight of the SGM was the unhindered expression of enthusiasm and feelings of hope. MD, Chairman and government nominee Sanjay Saraf seemed to be on the same page and vowed to take the organization ahead. “Before joining I went to meet Ram Bilas Paswanji and told him that I will join only when he supports and I am happy to inform you that he as well as the secretary offered their unconditional support to us” Bijender informed the delegates. The continuous fight in the courts has created a situation of uncertainties for the staff, business associates and for the cooperative. As far as I am concerned I have many other jobs to take care of but I am deeply concerned with the future of the organization, he added. Bijender also promised to work honestly and take the organization to greater heights. 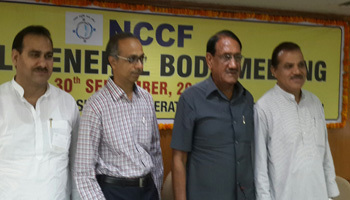 Sunil Singh, who was present in the audience, spoke about the lack of transparency in the working of NCCF in the past. He said while dalals are encouraged to do business, genuine cooperatives are kept at arm’s length and at the time of election they are debarred in a pre-planned manner. Nearly empty dais had inspired Sunil’s comment. He said even a PACS meeting has greater presence than this and blamed it squarely on the old team for this. There were just four persons on the dais: Chandra Pal, Bijender, MD A K Jain and govt nominee Sanjay Saraf. NCUI President Chandra Pal Singh Yadav who is also on the Board of NCCF promised to make amendment in the bylaws through AGM so that the genuine cooperative bodies are not discouraged. Chairman of NCCF himself exposed the falseness and manipulations (in the profit of NCCF) made by the officers of NCCF, including the high ranking officials who are on deputation from the Department of Consumer Affairs, vouched by its M.D. This is nothing but a day light robbery by misusing funds of the business associates and stashing it in Fixed Deposit to earn interest; meet administrative costs and show the rest as profit, under the regime of the ex-chairman, Sh Virendra Singh. The NCCF, earlier, had shown the cost of Indian Onion to the tune of Rs.2451.46 crores as sales under the head “Overseas through Associate Shippers” which were procured from local mandies & exported directly by its Associate Shippers for the period 2004-05 to 2013-14 without any purchase- sales transactions. NCCF has acted only a commission agent, by simply giving NOC to the Custom Authorities and earned fixed margin prescribed by the Govt. The figures are available in its website. This manipulation was done with a view to exaggerate its annual sales turnover, just not to get wrath of the Government and to save the image from nosediving sales figures. So manipulations are nothing new to NCCF.